Justice for Atty. Mia Mascariñas-Green, Justice for all slain environmental rights defenders! The Philippine Alliance of Human Rights Advocates (PAHRA), an alliance of human rights organizations in the Philippines, condemn the killing of environmental rights defender and lawyer, Atty. Mia Manuelita Mascariñas-Green, last Wednesday, February 15, in Tagbilaran City, Bohol. Based on reports, Atty. Mia, 49, died of bullet wounds in the head and body. Her children, one aged 9 and her two-year-old twins, were unharmed but they were shocked and shaken. In response to President Rodrigo Duterte’s blatant attack on human rights, continuing and rampant killings, railroading of death bills (bills to restore death penalty and lowering of the age of criminal liability), ordering the Marcos Burial in LNMB, sexist attack on women, while failing to fulfill campaign promises like end of ENDO, genuine FOI and the lack of decisive programs to end poverty etc. 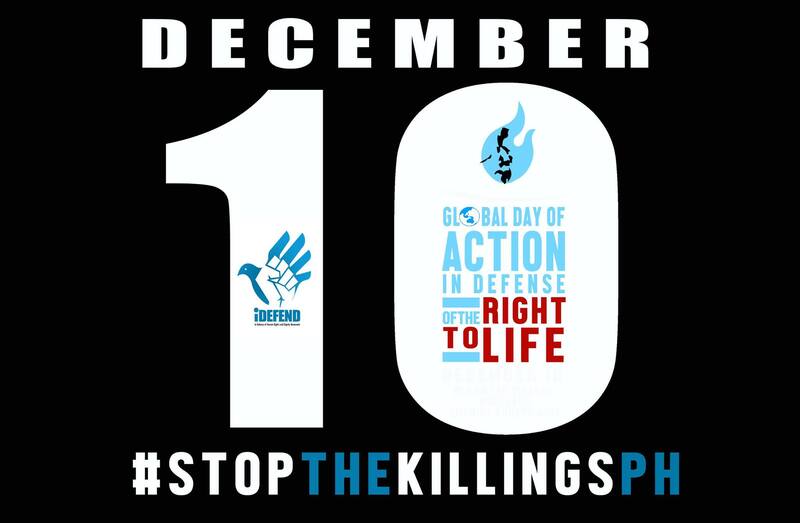 iDEFEND (In Defense of Human Rights and Dignity Movement) enjoins all human rights defenders and the public, including Filipinos and solidarity groups in different countries to unite and creatively protest against the rampant killings and violent governance of Duterte while failing to fulfill campaign promises on economic and social wellbeing of the Filipinos to a Global campaign to defend the RIGHT TO LIFE in the Philippines. (Paris, Manila) Philippine parliamentarians must shelve proposed draft legislation aimed at reinstating the death penalty in the country’s legal system, FIDH and its member organization Philippine Alliance of Human Rights Advocates (PAHRA) urged today. The Philippines abolished capital punishment for all crimes in 2006. PAHRA supports the position paper of the Philippine Coalition on the U.N. Convention on the Rights of Persons with Disabilities on the proposed Tax Reform Bill. We call on a Rights-Based Governance and inclusive growth especially for the most disadvantaged sector of the society.